Instead of a gallery walk, we had a gallery “drive,” proceeding south to north on the boulevard, parking about every two blocks to savor the art. Here you will see art for all ages, as a sense of humor linked the artists, and the works often sparkled with wit. 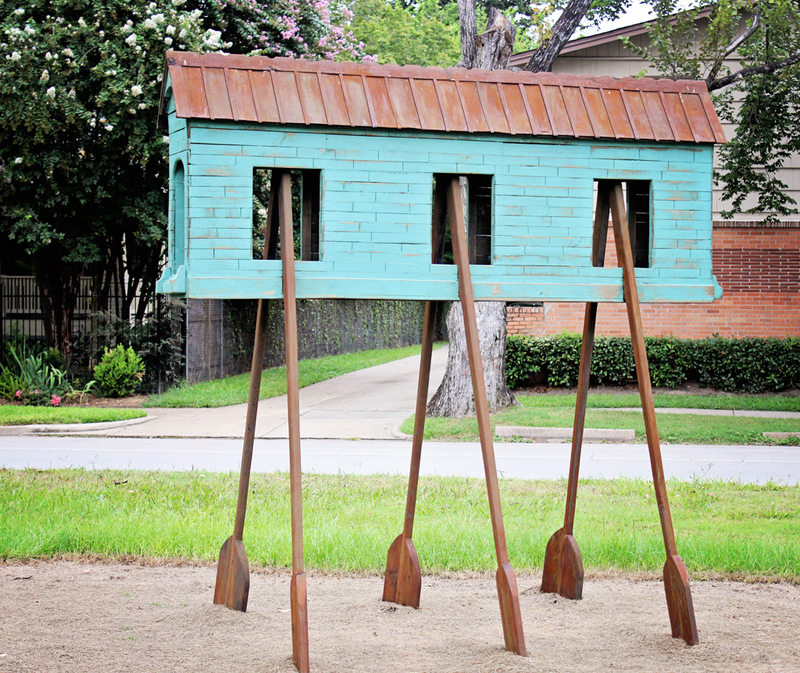 At 14th Street is From the Hood to the Heights by Patrick Medrano, a small green barn-like building supported by eight huge metal oars, a version of Noah’s ark. It resonates of a personal journey, navigating above the tide of society. Its combination of colors seems just right, and I’m sure its oars, though embedded now, will be able to pull free and propel it forward when the need arises. It is truly beautiful, and I would love to see a patron provide Medrano with the funds to rebuild it to ten times its present size, straddling a plaza, so we could walk between the oars and wonder at genius. How fun would this be? “From the Hood to the Heights represents art that is finished not by the artist,but by the elements of nature. Created 100% from scratch and made to change with time. “This is my proudest and largest public sculpture to date.” What a honor it is to display our creation in such a historic and beautiful part of our great city!” says Medrano. At 18th Street is Our Glass by Dean Ruck, two oblong teardrops of glass, one over the other, composed of circles of reflective material on an open structure. The top circles reflect the sky, the bottom ones the earth, generating a feeling of anchored particularity, which of course would change with the setting. The image seems familiar, but it is not — it may be an alien force, observing and biding its time while pretending to amuse. 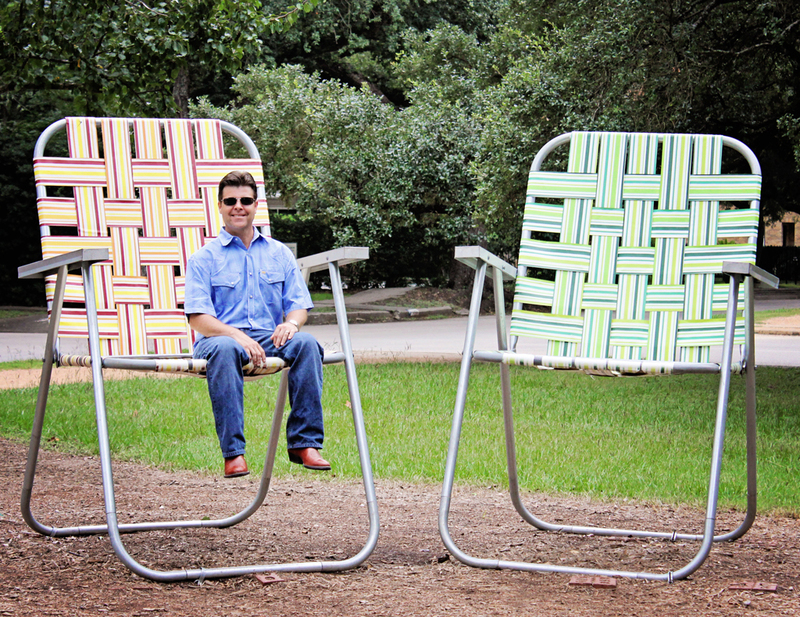 At 12th Street is Lawn Chairs by Paul Kittleson, offering the familiar look of the inexpensive and portable seating facility, yet amusing us because these chairs are several times the size of the ones you may have in your garage. If you did clamber into them — do not, since the signs say “Do Not Touch” — you would find yourself insignificant, in the words of William Butler Yeats, “a tattered coat upon a stick.” So smile and move on, before the chairs are occupied. Paul’s studio work has been exhibited in numerous museums and galleries both nationally and internationally. For over 25 years Kittelson has engaged the larger public audience through temporary site-specific works and community-based projects. Doesn’t Tarzan look just a little smaller nowadays? Can I tell you how hard I am laughing? I don’t think Tarzan can read the signs…smile. Between 6th and 7th streets is Pointing North by Carter Ernst, a gargantuan dog about six feet tall and eight feet long, a setter that has found its prey and is indicating the location. As a sculptor, I enjoy working figuratively, bringing my chosen subjects alive through gesture, whether it be dogs, logs, birds, flowers etc. I am enamored with fabrics and other tactile materials that I can manipulate over a supporting armature of steel, wire and resin. Some of the fabrics I use are remnants from thrift store clothing. 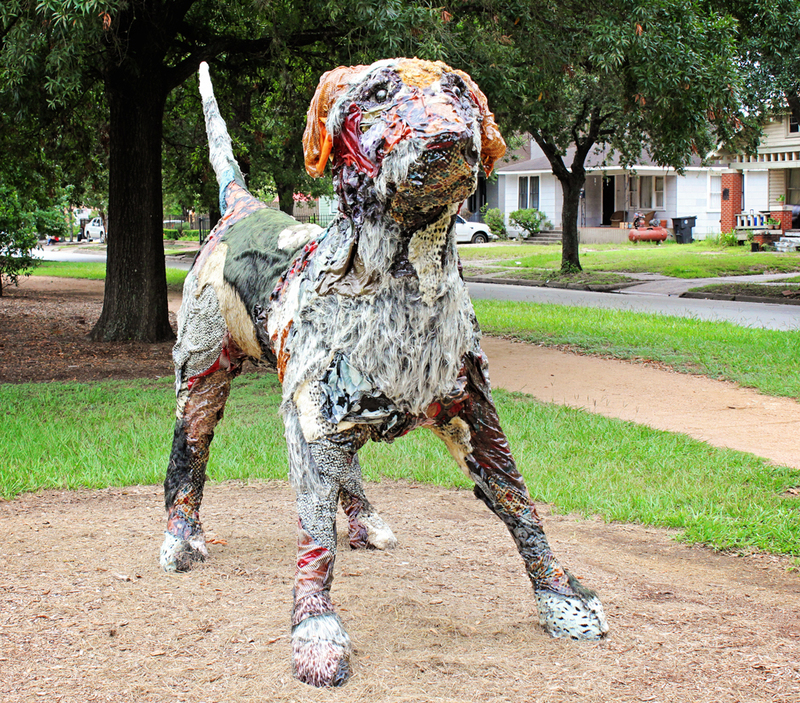 This large hound pointing true north is modeled after one of my handsome hounds who occasionally gets to visit the Heights to take a stroll down the Boulevard.” says, Carter Ernest. Dean came together in a collaborative quasi-public environments to re-purpose architectural structures and remnants of no perceived market value into works of art. “We want to bring attention and recognition to under appreciated and ordinary buildings and their histories.” says Dan Havel and Dean Ruck. It was a grand morning on the Boulevard with our cup of coffee, and a perfect 75 degrees! Yes, even in Houston we can see weather like this…maybe every ten years. This was part 2 of the Heights Boulevard Tour, if you missed part 1 click here. So I have to ask, “Which sculpture was your delight? My favourites are the chairs… you could curl up in it and there is enough space! Brilliant! Public art is a gift to everybody. Great post! The “Ripley’s Believe it or Not” lawn chairs had me laughing out loud! The others are also some awesome oddities, great share. Have a wonderful weekend my dear friend. How cool. What unique finds. Love this collection of human creativity. So hard to choose a favorite Laurie…but if I had to pick, I’d say the boat and the teardrops of glass. I love your interpretation of “Noah’s Ark”… and of course how could Tarzan pass up sitting on those whimsically giant lawn chairs 🙂 Wonderful! What a cool location! I love Tarzan in that chair! So funny. What a good sport! I really like the ‘Wildlife Sanctuary’. It is bizarre and cool at the same time. It tells a mysterious tale. I think my niece lives in this area. They have a super nice townhome in a hip part of town. I visited briefly and it was a delight. Great photos! Oh – how fun is all of that art!? Yes it all is permanent art. What a fab even, the lawn chairs were my favourite because I love interactive art. So glad you included information about these incredible pieces of art. Fascinating! The first and last are the ones that really captured my imagination. Thanks too for the link back to the first post as I missed it while on vacation! How wonderful to have so much public art in the area. I love all the sculptures but my favourite is the one featuring the chairs (and Tarzan, of course). How truly bizare Laurie ! 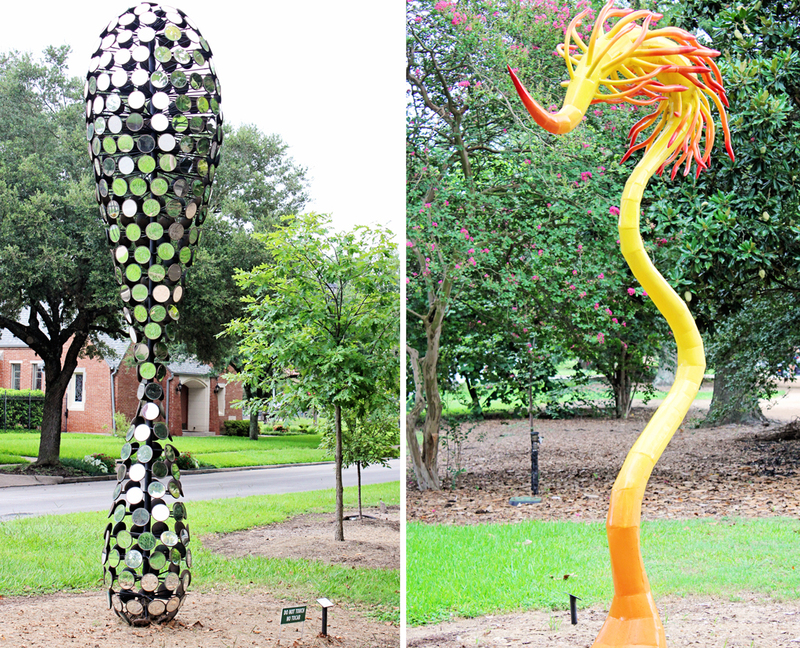 Are these permanent sculptures or is it a temporary exhibit? 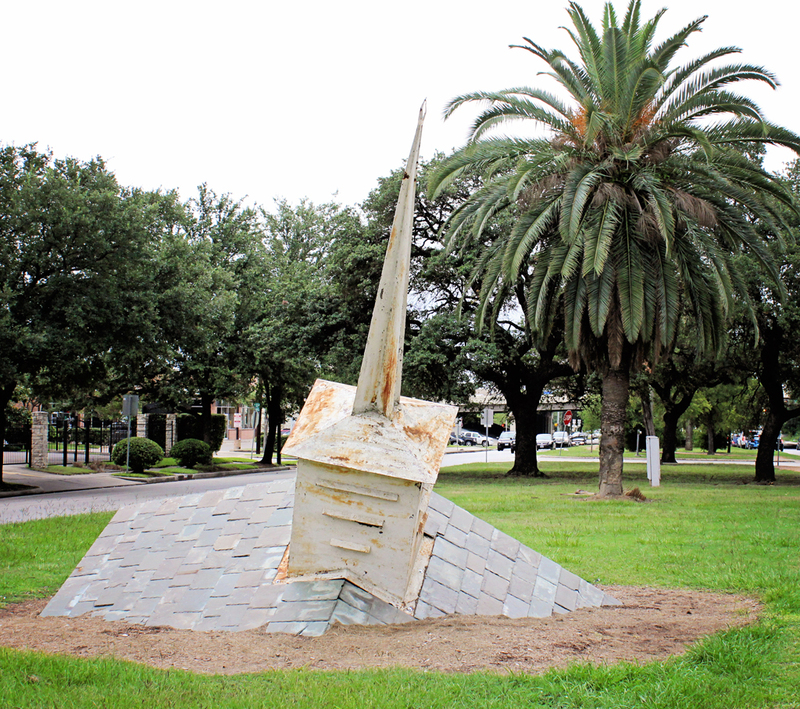 My favorite by far is the final work of the buried steeple. How do the local people feel about the art??? These are permanent! The locals love it, because it gives the neighborhood something so unique that nobody else has.The homes can run into serious six figures. Art that is so relatable and fun. All of these are wonderful, Laurie, and the lawn chairs are most definitely my favorite. A fun place.. I did not think those chairs are also functional. The picture of your son sitting there is funny. This is my husband Tarzan, but yes he looks like a little boy in that gigantic chair! Wow, those were all so unusual. I cannot believe they say do not touch, THAT IS ABSURD. If I made on of those i would want everyone to touch it and use it and then i would make a another one when that one wore out. I like how the artist made the dog one with fabrics… and then somehow weather proofed it. VERY COOL. Intriguing collection, Laurie! 🙂 I like the glass work and that ‘walking’ house. Really cool Laurie! Thanks for sharing such an unusual art artistic display!! Very fun! loved all the sculptures! specially the last one and the big dog! Nice pics!!! I am so glad that we have artists in our world – visual poetry. I’m loving them all especially the lawn chairs. LOL But, I do have to say I really like the wildlife sanctuary. I can imagine all the cars stopping to look at them. I love art of this type because the beauty and intrigue is in the eye of the beholder. Thank you for sharing. I enjoyed looking at these but have to say that Tarzan in the over-sized lawn chairs was my favorite! I really enjoyed the gallery “drive”. Lots of creative and fun sculptures! Thank you for the lovely Heights Boulevard Tour, Laurie. What a great tour! Thanks for sharing …… LOVE Tarzan on the big lawn chair – “and that’s the truth”! Love the lawn chairs lol. Thanks for taking us on the tour! Wonderful public art–thanks for the tour. I have been over there, it’s nice. Yes, but that place is only 15 minutes away. Lots of great creativity here. Those lawn chairs remind me of the skit from a 60’s show – Lily Tomlin I think – she played a character called Edith Ann and sat in a huge chair – silly stuff!